Enzo Bearzot, the legendary coach who led the Italian soccer team to its third World Cup victory in 1982, died yesterday at 83. I guess you don’t need to be a soccer fanatic or even a fan to mourn him, being a normal Italian, or otherwise a non-Italian who loves soccer, would do just fine. He has certainly been one of the most beloved Italians of his time, and this, at least in my eyes, not just because of his success as a coach, but also, if not above all, because of his human qualities: his sobriety, fortitude, integrity, and courage. That’s just how I’d describe Enzo Bearzot’s character. And that’s also how those who had the privilege of knowing him well are actually describing him in these sad hours of mourning (see here, here, here, and here). Bearzot will be remembered for the undying belief he showed in his players and his tactics, qualities he admirably demonstrated in Spain. 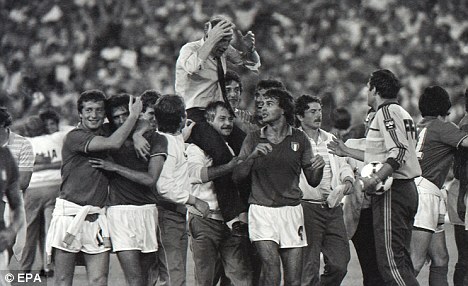 Bearzot took tremendous flack for selecting out-of-form forward Paolo Rossi at the start of the 1982 tournament. The criticisms only grew louder as a lethargic Italy stumbled to draws against Poland, Peru and Cameroon in the first round, and only managed to qualify for the knockout stages by the skin of its teeth. Rossi had failed to score in all three matches, and when he was substituted in Italy's next game against Argentina, again without scoring, Italian journalists were calling for the manager's head. But Bearzot had faith in Rossi and he was duly rewarded. Rossi recorded a marvelous hat trick against Brazil in Italy's next match scored both goals in a 2-0 win over Poland in semifinals and netted the opener in a 3-1 win over West Germany in the final. With six goals, Rossi finished as the tournament’s top scorer and was named the competition's MVP. The morning after that triumph Bearzot walked into the press conference, poured champagne for all the journalists who had vilified him and invited them to join him in a toast: Forza Italia. This product of the Italian FA coaching regime had inspired a new mentality which generated a subsequent World Cup victory in Germany 2006 and which injected ambition, energy and adventure into Serie A. My friend Enzo - who died on Tuesday aged 83 - was pure class. Rest in peace, dear old man, we will always miss you.